The game will be played on Monday, July 2 from 6pm AEST and you can follow it live with The Roar below. A 6-0 defeat tour defeat at the hands of England included a T20I loss that came at the fag end of the tour but the tourists would like to take some positives away from that encounter going into this tri-series in Zimbabwe. Australia’s batting would be one, having gotten themselves close to the England score of 221 thanks to a 41-ball 84 captain Aaron Finch, whose presence at the top of the order looks to have rejuvenated the side no ends. The earlier call to have him man the ODI middle-order was an understandable but ineffective call and that promotion back as an opener might allow Australia a chance to take on the Powerplay overs in a better manner. It also brings its own sets of problems with it though. Travis Head and D’Arcy Short are not batsmen Australia can rely – for now – against spin once the ball loses its early shine and the fielders have been sent back and that could be an issue for the side against a team that has spin quality. Mohammad Nawaz and Shadab Khan are two spinners as different from each other as chalk and cheese but their efficacy has seen Pakistan go through a sterling run since the end of the previous World T20. They are the number one side in the world and not without reason – they have won 20 of their 23 games since that tournament and have catapulted to the number one position in the world. While a weak Zimbabwe opposition was never going to test them out in the opening game, what was impressive to watch was their clinical finishing on the opening day. They built on a Fakhar Zaman half-century through Shoaib Malik and Asif Ali, who were involved in an unbeaten 62-run stand off just 32 deliveries at the end. And then, as mentioned earlier, the spinning pair of Nawaz and Shadab did their bit to catch Zimbabwe well short of the target. 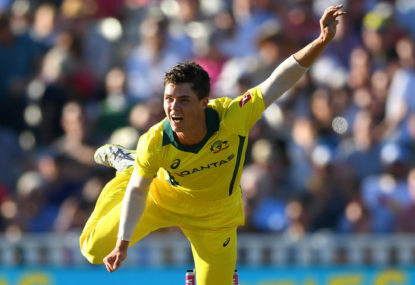 With Australia’s recent weaknesses against spin well-chronicled, it will be interesting to watch how their batsmen extricate themselves from those problems and if they can get past arguably one of the most consistent T20 sides in recent times. The team batting second to have an advantage on a ground where the boundaries look to have been brought inside a great deal.